Mode of Trip: : Tea-House / Lodge Basis. Crossing of Thorong La Pass at 5,412m – a great sense of accomplishment! Annapurna Circuit Trek is one of the classical and most diverse trek in Nepal. Round Annapurna Circuit Trek is definitely not like a walks in the park – they are sure to challenge you physically and mentally pushing your limits. 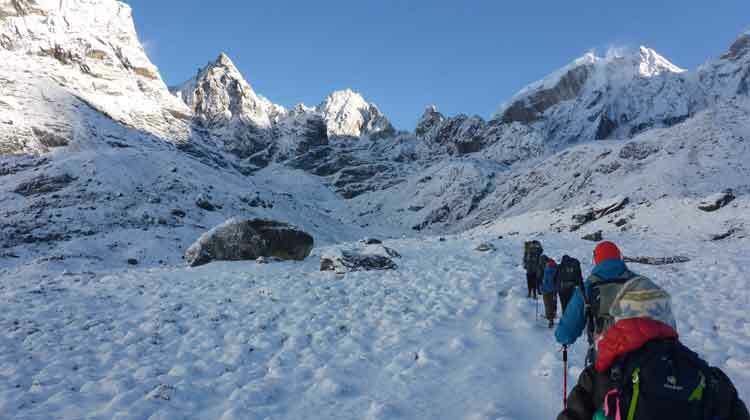 If you have extreme yearning to walk on wild Himalayas, this trek makes an incredible journey beyond travel. 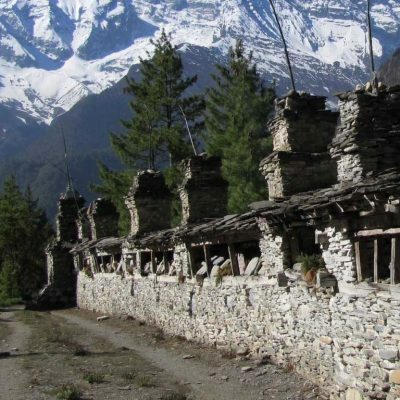 13 Days Annapurna Circuit Trek route follows an anti-clockwise route behind the 50km Annapurna massif. As we start gaining elevation, lowland Hindu community gradually gives way to Tibetan group and architecture & agriculture changes accordingly. 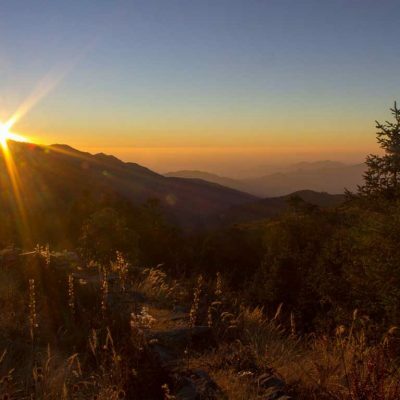 The stunning Himalayan ranges including 8,000m+ peaks – Annapurna and Dhaulagiri ranges comes full into view. Some significant landmarks includes: the Upper Pisang – Braga route which offers great cultural insights and stunning views of Annapurna II and IV. Likewise crossing Thorong La pass at 5,416m/ 17,770ft, offers you a real sense of achievement. 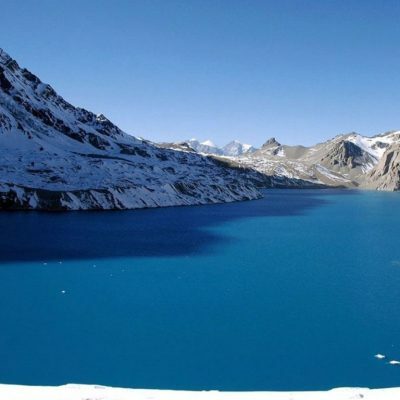 13 Days Annapurna Circuit Trek itinerary is designed to allow proper exploration and make the short trekking . The trekking route avoids a recently build road as long as possible. The total length of round Annapurna trek varies from – 160 – 230 km (100 – 145 miles), depending on where motor transportation is used and where the trek concludes. The Trek Start from Dharapani which drive 6, 7 hour by jeep or Bus from Kathmandu and fly from Jomsom to Pokhara. 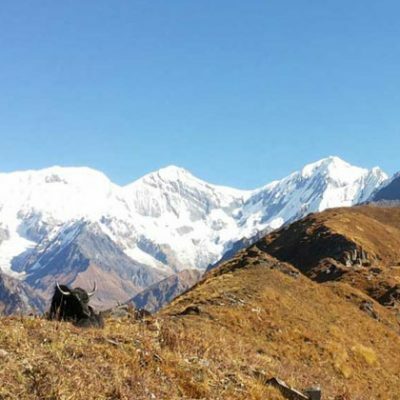 Autumn (September – November) and spring (March – May) are the best time of the year for trekking in the Annapurna region. The weather during these season is excellent with outstanding views. 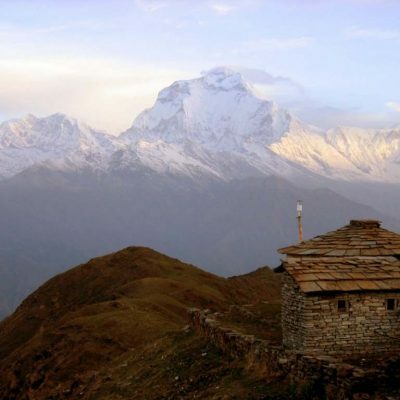 If you wish to enjoy lone time with nature, then you can consider trekking Annapurna in (Dec, Jan & Feb). However, the extremely cold temperature might not be suitable for most of the travelers. Trekking in Monsoon is full of risks – landslide & flood – but it can be boon for a keen botanist. 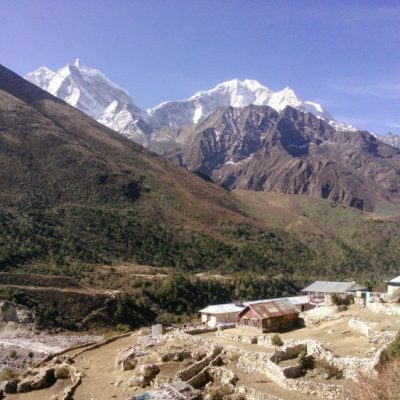 Good news – Annapurna region is least suffered by the earthquake in April. According to a report of Nepali Ministry of Culture, Tourism and Civil Aviation, only 6 of the 250 hotels, guesthouse and inns were affected by the earthquake. And those affected requires minor repairs. The trails are totally unaffected and safe to travel as it was before. Likewise, all the 30 bridges on the trails are unharmed. 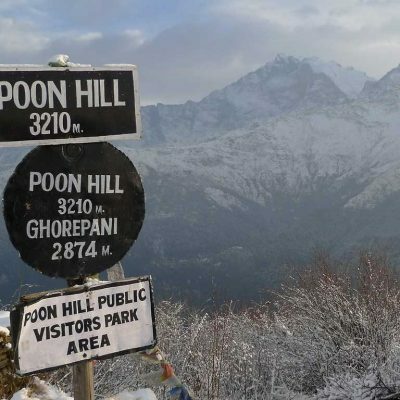 But the area of Bagarchhap, Bhratang, Kagbeni and the southern part of the Annapurna sanctuary are marked as risky place when traveled in monsoon season. Adventure Great Himalaya assures you the safest trail route accompanied by an experienced trek guide. We dial everything to make your travel safe and comfortable. Travelers are required to obtain Annapurna Conservation Area Project Permit (ACAP) and TIMS card to enter the Annapurna region. Trek to Pisang 3, 230 m – 05 hrs. Trek to Manang Village 3,450 m – 05 hrs. Rest day at Manang for local hikes and acclimatization. Trek to Yak Kharka 4,110 m – 04 hours. Trek to Thorang High Camp 4,600 m – 04 hrs. Cross Thorang-La 5,416 m and to Muktinath 3,800 m – 07 hrs. Trek to Jomsom 2, 715 m – 05 hours. The day begins with the drive to Dharpani by jeep from Kathmandu via Prithvi Highway. We go through Dumre -Besisahar – Bhulbhule – Bahundanda – Tal– Dharapani . Passing across pretty waterfalls, small streams that join the Marsayangdi River, suspension bridges, barley and potato fields, numerous overnight camps with tea house occupies the entire way towards Dharapani Overnight stay at Dharapni..
Today Our trekking destination is Chame, which is Headquarters of the Manang Distric, we will walk through of forest with amazing Views of Massif Annapurna 11, Annapurna IV and Lamjung Himala. On this day we will cross local village and some small hotspring as well. Over night Lodge in Chame. Trek To Upper Pisang 3, 230 m – 06 hrs.After breakfast, we start our trek negotiating a steep and narrow path through the lush forest. Eventually we reach a dramatic curved rock face soaring 1,500m above from the river. This is probably the steepest section of Marshyangdi valley. As we cross the rock, the valley opens up with incredible views. We continue walking until we reach Lower Pisang. Trek To Manang, 3,450 m – 05 hrs.Today we have trekking options to Manang but we follow the Upper Pisang route via Geru. 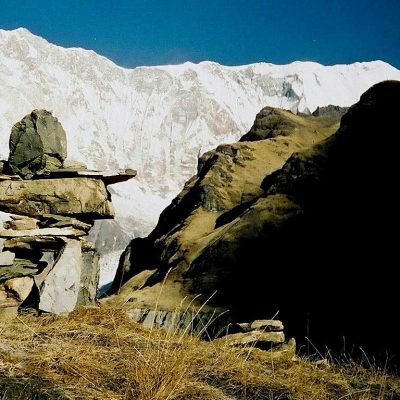 This trekking route ensures the majestic views with stunning landscapes and mountains including Annapurna and Pisang. Gradually we start noticing a change in landscapes and vegetation. The climate becomes rough and dry as we reach Manang. 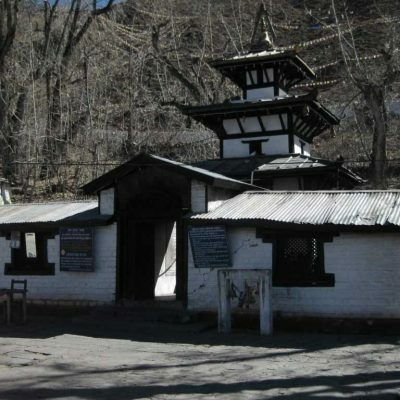 On the way, we visit Bagre Monastery – the largest monastery in Manang district. Rest day at Manang for local hikes and acclimatization.An important rest day for acclimatization before reaching high altitude and up to Thorang –la, here with short hike exploring Manang village beneath towering Annapurna and Gangapurna peaks, a nice short hike up for views of Gangapurna Glacier and the Manang glacial Lake. Trek to Ledar 4,230 m – 05 hours. After a good rest at Manang, walk towards Yak Kharka, an interesting high altitude walk with views of mountains, crossing small streams to reach at Yak Kharka, a small settlement with incredible views of Gangapurna, Annapurna III and Chulu Peaks. Trek to Thorang High Camp 4,600 m – 05 hrs.Morning walk leads closer to Thorang-la as the walk progress crossing a bridge and then a climb along the Jarjung river, then leading at Thorung Phedi for short rest and then climb the last hour uphill to Thorang High Camp for overnight stop. Cross Thorang-La 5,416 m and to Muktinath 3,800 m – 07 hrs.Start the early morning walk on this Big Day! A thrill and highlight of this great adventure, after breakfast a long climb up to Thorang-la with steep haul to reach at 5,416 m / 17,700 ft on top of Thorang-la festooned with Buddhist prayer flags.Highest point of the adventure certainly requires high spirit and strong mind to reach this high point.The top offers superb vista landscapes and snowcapped peaks, from here a long descend to Muktinath at 3,800 m.Muktinath a holy place for both Hindu and Buddhist the word Muktinath literally means ‘the place for Nirvana or Liberation’. After Muktinath, rest of the journey is easier with moderate walks all the way with a big drop of 1,200m downhill to Kaligandaki river valley, this pleasant walk leads to Kaligandaki river valley, from here walk to Jomsom, headquarter town of Mustang area with a small airstrip above Kaligandaki River. After Jomsom walk to Marpha, one of the most charming village with white painted houses, paved streets and well kept lodges. At Marpha celebrate with apple products cider, brandy and juice this area from Kagbeni to Larjung is famous for delicious apples. Fly To Pokhara-25 MinuitBe noted – flights from and to Jomsom are possible only in the morning. So after breakfast, we take an early morning flight through Kali Gandaki Gorge from Jomsom – Pokhara. A representative from Adventure Great Himalaya will receive you from the Pokhora Airport and transfer you to the hotel. Enjoy your free day enjoying the sights and sounds of Lake City – Pokhara. Drive Back to Kathmandu By Tourist BusAfter breakfast, drive from Pokhara to Kathmandu which takes around 6 hours. Upon arrival at Kathmandu, you can opt to take a rest or go for half-day sightseeing tour to UNESCO world heritage sites.In the evening, attend a farewell dinner hosted by Adventure Great Himalaya to celebrate the successful completion of the trip. 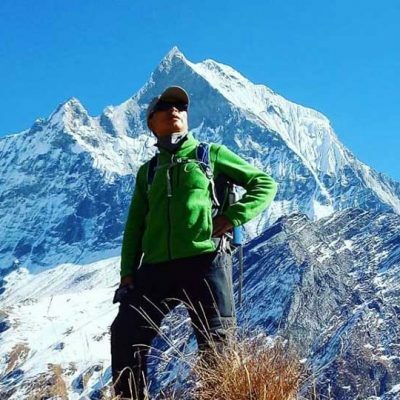 Trekking Guide: An experienced, helpful, friendly and English speaking Trekking guide , everything for him such as well paid Salary, Food, Drinks, Accommodation, Transportation and Insurance.